Supper clubs are all the rage these days, particularly in London but there have been more and more popping up around Manchester too over the past few years. So it’s perhaps surprising that I ‘d never attended one. After enjoying my first GastroClub earlier in the year I was feeling sociable and booked myself on two separate events just a few weeks apart. The first held by fellow local bloggers ‘Manchester Foodies’, aka Jamie & Anna. I’d met them a couple of times before and consider them to be some of the nicest people I know, they also know their food. 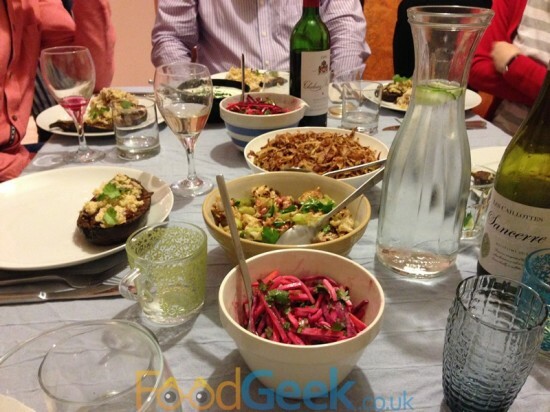 I’d been tempted by their previous supper clubs but never made it for various reasons so when I heard of their Yotam Ottolenghi inspired night I snapped up tickets immediately. I’m a big fan of Ottolenghi’s Middle Eastern cooking which makes healthy food seriously exciting. We arrived nervously at Jamie and Anna’s Rusholme house but were relived to find we were neither the first, nor the last guests. After being introduced to the others, getting over our nerves and a serious case of kitchen envy (it’s ace!) we were soon enjoying a welcome drink. A middle eastern take on a Kir Royal with rose syrup added to Prosecco. I’d have preferred a little less rose syrup as it’s powerful stuff and was slightly too sweet for my tastes. Needless to say I happily finished it anyway and that was to be the only criticism, constructive or otherwise I had of the entire night. Everything that followed was simply brilliant. Starting with a selection of homemade dips including ‘Pureed beetroot with yoghurt & za’atar’, ‘Butternut squash & tahini spread’ and ‘Hummus kawarma with lemon sauce’ served with lovely warm Turkish bread. All were excellent and offered great variation. 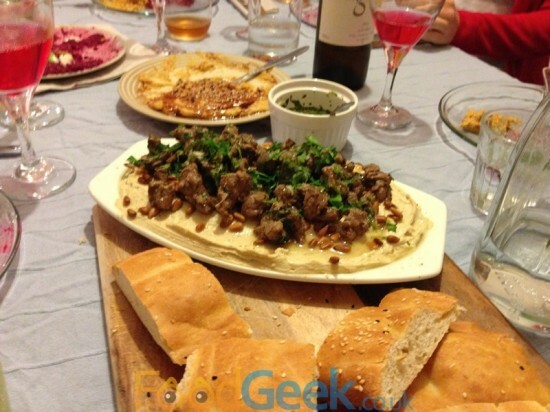 My favourite was the hummus topped with lamb neck fillet, one of my favourite cuts of meat. Mrs FG loved the ‘Butternut squash & tahini spread’, i’m banned from buying more cook books since smashing the 100 barrier a few months ago but I suspect i’d have no problem purchasing Ottolenghi’s ‘Jerusalem’ on the strength of that dish alone. We both loved the sweet pureed beetroot topped with tangy goats cheese. Main course was ‘Chicken with caramelised onion & cardamom rice’ and ‘Chermoula aubergine with bulgar & yoghurt’ and a variety of side dishes including ‘Mejadra’ (lentils, rice, deep-fried onions), ‘Roasted cauliflower and hazelnut salad’ and a ‘Root veg slaw’. Again everything was cooked brilliantly, each individual dish was great and even more impressively they combined to make a wonderful plate of food. I particularly enjoyed the ‘Roasted cauliflower’ salad, I love roasting cauliflower and it tasted amazing combined with toasted hazlenuts and pomegranate. I’d never eaten or even heard of Mejadra but i’ll be looking out for it in future as it was lovely. We were secretly slightly dreading dessert as neither of us are huge coconut lovers. 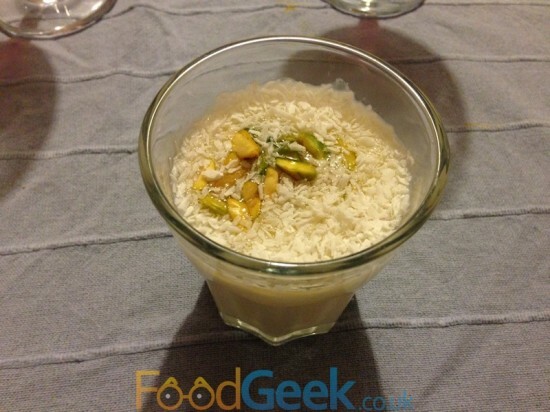 I’d considered asking if it was possible to have the ‘Muhallabieh’ (coconut & pistachio pudding) without coconut. I decided against it as we’re not fussy and we also like to be proven wrong. Thankfully I was proven well and truly wrong, it was a delight. I believe it’s made with milk rather than cream but it had a fantastic creamy texture. The coconut flavour was subtle and worked so well with the milk and pistachio that I genuinely enjoyed it. The Muhallabieh would have been a fitting end to any meal but there was still more to come. 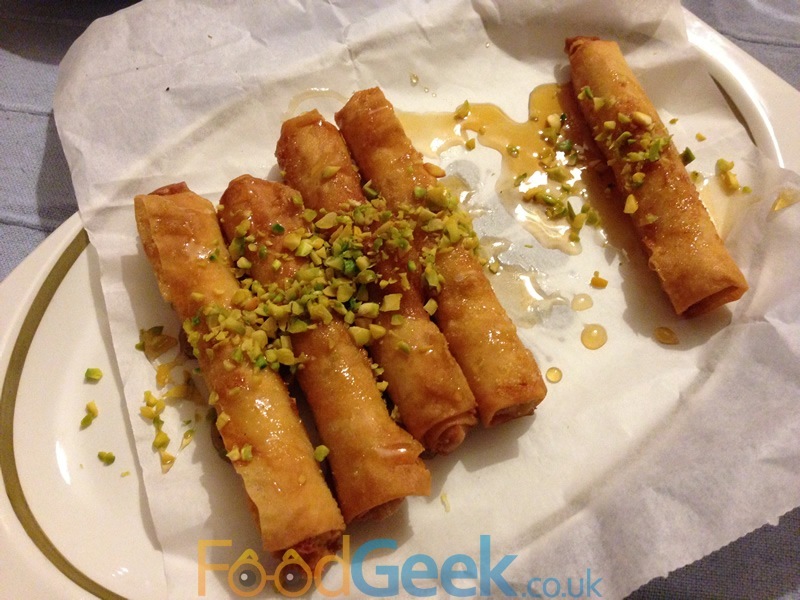 I adored the ‘Sweet Filo Cigars’ served with coffee. Hot, crispy rolls of filo filled with a delicious combination of nuts and syrup, seriously additive stuff! I can’t say enough good things about the whole evening, I already knew Jamie & Anna were nice people and serious foodies, now I also know they are great cooks and have an awesome kitchen. All of the food on the night was worthy of any restaurant. The social aspect is as important as the food at events like this and we were lucky to meet some very lovely people and enjoyed conversations about everything from restaurants and food to TV series finales. Like most supper clubs it was BYO (bring your own) after the welcome drink. We’d taken a couple of bottles of wine but after running out another local food blogger, the very lovely female half of Good Gobble blog took pity on us and shared hers. Jamie & Anna have certainly set a very high standard for me when it comes to supper clubs, I just hope that future events, including my next in 2 weeks time can live up to this one. 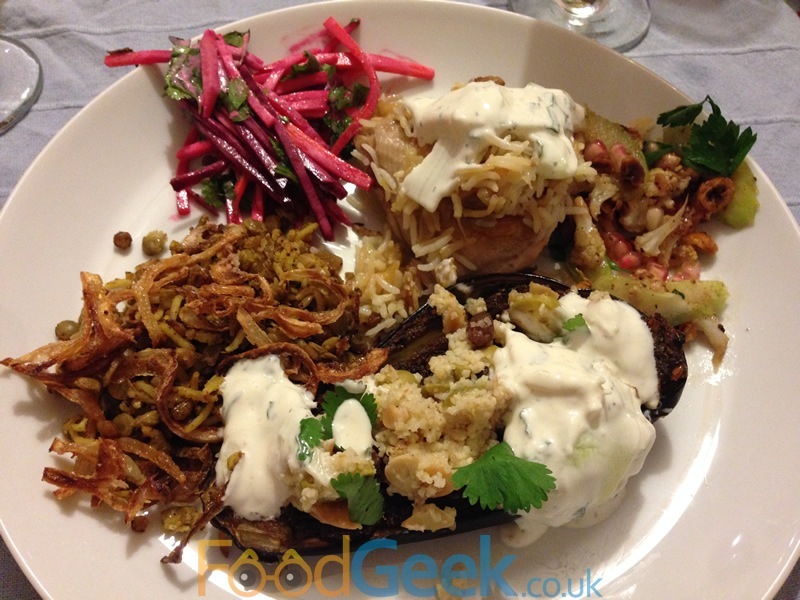 Previous: Back To Manchester House – 12 Course Tasting Menu & Aiden Byrne On Top Form!